GE Transportation has delivered the first new Evolution Series locomotive to Indian Railways. Described by the operator as its first fully digitally enabled locomotive, the 4,500 horsepower diesel-electric locomotive is the first of 1,000 to be manufactured by GE by 2025. It follows the signing of a $2.5 billion (∼€2.05 billion) agreement in 2015. Initially 40 locomotives will be manufactured at GE’s Pennsylvania facility in the USA. The other 960 locomotives will be built in Marhoura, Saran District, Bihar, India. 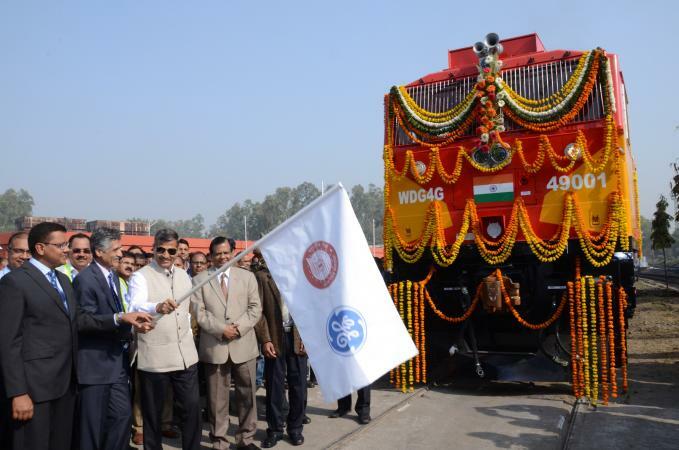 Indian Railways chair Ashwani Lohani said that the delivery marks a “paradigm shift” in its family of locomotives. He added: “I would like to compliment GE for this new generation fuel-efficient locomotive. GE said that that the diesel-electric locomotives have a higher fuel efficiency than previous Indian Railways locomotives and have been setup for digital predictive maintenance. They have been manufactured using 70 per cent local content and feature air conditioned cabs, heated wind screens, toilets and digital displays. At the same time, GE also unveiled a $35 million Roza maintenance shed in Shahjahanpur, the state of Uttar Pradesh. The 20-acre site will be equipped for digital condition monitoring with a team of technicians who will use analytics based maintenance practices to deliver improved asset availability and reliability for the fleet. The site also includes a modern training facility for Indian Railways train drivers.